John Hennessy has shown remarkable courage to stand before the Commission and deliver his story. 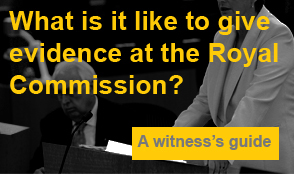 The accounts delivered by John and his fellow victims are some of the most harrowing of the entire commission. This video interview with John from ABC WA reporter Jade McMillan gives you an indication of the courage these victims display in their fight for justice.